I am delighted to share another beautiful submission to the Monk in the World guest post series from the community. Read on for Katy Taylor's reflection on presence practices. Growing up in a family that put a lot of value on work, in combination with being an Enneagram type One, I have had to consciously practice in order to learn to slow down to the pace of nature, of my body, of the seasons… For many years, while I loved how I felt in nature, when resting, at ease, or in meditation, it’s been a big challenge to prioritize this over getting things done right and on time. Especially when I am caught in a cycle of working, what helps me to return to the holiness and grace of the present moment are what I call presence practices, infused throughout the day. These simple practices mark the rhythm of the day and the seasons, and include somatic awareness and movement, singing, mantra, blessing, gathas (mindfulness verses), and prayer. In the morning, when I awake, the first thing I do is listen to and move my body. Usually she wants to elongate and reach toes and fingers away from each other, or to gently rock the pelvis forward and back, arching and flattening to bring mobility and fluidity. Then I say a prayer in bed, with my hands on belly and heart, welcoming myself. I prefer to learn a prayer by heart and to pray it for months or even years so that it gets into my bodysoul (body-heart-mind-soul) in a deeper way, feeling like a home, a refuge for my mind, a channel for my heart. I have a few on rotation now, depending on my mood—an adaptation of two of Marianne Williamson’s morning prayers (from Illuminata), the first stanza of e.e. cummings “i thank you god, for most this amazing day…,” and Thich Nhat Hanh’s Waking Up gatha (mindfulness verse). I arise slowly, and once out of hearing range from my husband, I sing a morning blessing, depending on the energy of the day—anything from “Morning light calls my body…” to the more rowdy “Do you want to sing open the morning…” (Laurence Cole). Singing voices me, embodies me, helps my soul feel present in / as / with my body. If it’s moving towards dawn, I’ll sing a song about the interface of light and darkness, and when dawning light arrives, looking out to the sky, I sing “Welcome daytime, welcome light…” (adaptation of a round by Mountain Falls). Sometimes I do a few rounds of bowing, surrendering my life to God in the unfolding of the day. I begin with hands at heart, then reaching up to the heavens, and coming back through the heart, blending heaven and earth as I move down through hands and knees to Child’s pose. Here I rest with my head on the floor, below my heart, taking a few humble breaths, and then reversing the process until I arise, standing as a human being, chalice of God. This practice can also support me during the day. Morning practice usually concludes with movement to honor my body’s need for moving expression. In addition to SomaYoga, I have found the many movement practices from Camille Maurine (Meditation Secrets for Women) to be particularly helpful in connecting with my body’s rhythms with all beings. I pulse, reach, roll, elongate, contract, slide, glide, flow, release (and more! ), following my bodysoul’s promptings, her desire to be fully alive, allowing sound and adding mantras as needed: “I give breath/life/love; I receive breath/life/love” (Camille). Often a song accompanies me, too: “Trees grow slow” (Laurence Cole), “Steady as a rock” (unknown), or “I am me” (Paul Barton). In the kitchen, a blessing song or grace over the food I am preparing and eating reminds me of the sacredness of life nourishment becoming my body—“Bless this food, bless my life…” or “May we be happy, may we be loved and well-fed…” or another call to presence. Throughout the day of work, index cards of practices at my desk remind me, among other things, that “Life loves me,” to breathe consciously, or to say thank you to everything I meet today. Tea always accompanies my work as a healing, calming presence. Singing also supports me—“There is work to be done…” (Sarah Nutting), which also includes a reminder of a “wide heart” or “The only way through is through…” (Diane Baker), with its reminder to take one step at a time or “Í am calling you,” reconnecting me with my deep soul-yearning for God. On breaks, I look out or step out into the season, savoring its invitation to be, to be blessed, to be present, or connect with my husband or a friend. These practices give my work experience living, breathing, singing expression, helping my soul feel presenced, here. At the end of the work day, a closure gatha based on Thich Nhat Hanh’s Waking Up gatha helps me surrender the work day and embrace my need for rest, pleasure, and relaxation. If I didn’t do a yoga-nidra meditation as a break, I might do it now, or often a walk helps me reconnect, breathing in the air, feeling my feet, taking in the sounds and sights of the neighborhood—and if needed, a gatha like “present moment, wonderful moment” (Thich Nhat Hanh) or another song. Dusk invites another round of “Light and darkness” (unknown) and the evening song “Welcome darkness…” (Mountain Fall’s original version). Bedtime includes a gratitude practice, a surrendering the day song, and another Marianne Williamson prayer, learned by heart. This choice to sing, pray, and bless myself continuously throughout the day calls me back to presence, rewiring my brain to see through God’s eyes instead of my workaholic, speedy ego’s eyes, and brings my whole bodysoul alive. I am blessed. 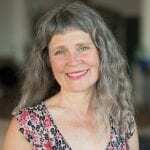 Katy Taylor is a Holistic Life Coach, SomaYoga Teacher, Vocal Coach and singer, and Interfaith Minister. She helps people practice presence to come home to their bodysoul and find more ease and resilience in their lives. She has a free e-book of practices on her site: https://katytaylor.com/welcoming-the-sacred/.